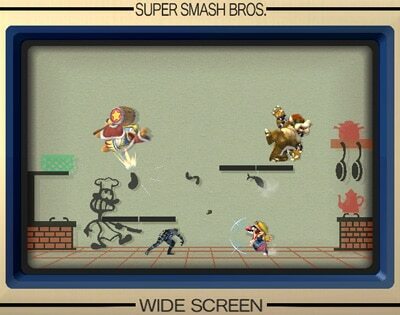 This stage is 2-D, and for some reason everyone becomes two-dimensional when they fight here. 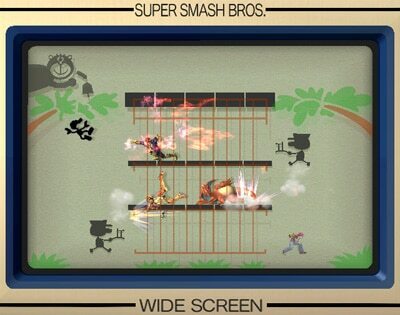 It makes sense—this IS a Game & Watch. 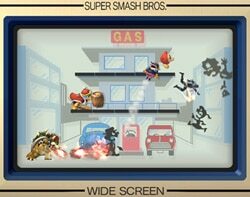 So what is Game & Watch, exactly? 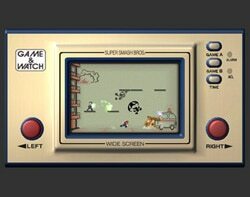 Well, the Game & Watch series was made up of handheld electronic games that Nintendo began releasing in 1980. Over 12 million were sold in Japan alone, creating a huge boom. 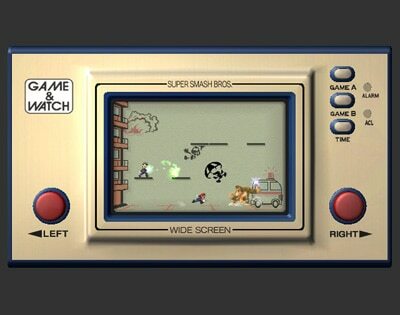 New games in the series continued to be released even after the Super NES was launched in 1991. 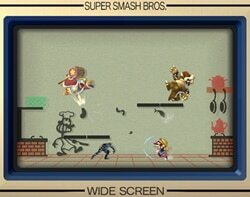 And this is the odd stage we built based on the old Game & Watch designs. 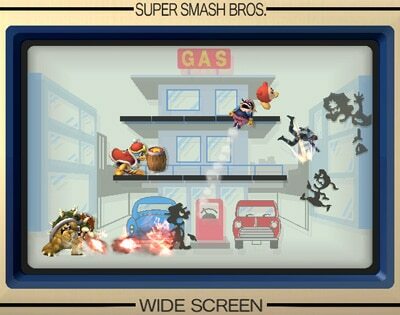 If you look closely, you can see that the characters have become 2-D.
Basically, this part is modeled after the Game & Watch "Fire" game. If you land on the rescue team’s blanket, you can make big jumps like it was a trampoline. 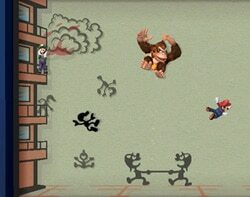 Boing! Ahhh... Is bouncing a good thing? Or just inconvenient? Over time, the stage will change. Amidst the plethora of Game & Watch games, what could appear? Or "Lion." To the left and right are the lion tamers. Even "Chef!" The chef can launch characters. There’s all sorts of stuff in here that leaves the youngsters behind. This game really has no scruples at all, does it? Sorry!